Its major export partners are Italy, Germany, and China. Its main exports are crude oil, refined petroleum products, and natural gas. Its major import partners are China, Italy, and Turkey. Its major imports include machinery, semi-finished goods, food, and transport equipment. Located in Northern Africa, Libya has a 4,339.00 km border with Algeria (989 km), Chad (1,050 km), Egypt (1,115 km), Niger (342 km), Sudan (382 km) and Tunisia (461 km). It has a 1,770.00 km coastline. The country has a few dormant disputes, include Libyan claims of about 32,000 square km near the border with southeastern Algeria. Tripoli is the capital city of Libya. It is located on the northwestern portion of Libya, on the edge of the desert close to the Libyan border with Tunisia. The city also borders the Mediterranean coast. Tripoli was founded by the Phoenicians in the 7th century and became the capital of Ottoman in the 19th century. Tripoli became the sole capital of Libya after the 1969 revolution. Libya is an African country covering 1,759,540.00 km2. This makes it the 16th largest country in the world and about 2.5 times the size of Texas; slightly larger than Alaska. Its geographic coordinates are 25 00 N, 17 00 E and Tripolis is the capital city. The name Libya derives itself from the Libu, an ancient Libyan tribe first mentioned in the 13th century. Its ISO code is LY. Libya has a mean elevation of 423 m above sea level. IT has a Mediterranean climate along the coast and an arid climate in the interior. Its terrain is mostly barren, with flat and undulating plains, plateaus, and depressions. Libya has a population of 6,541,948 making it the 106th largest in the world. The majority of the population lives along the Mediterranean coast. Arabic is the official language; Berber is also widely spoken. The majority ethnic group is Berber and Arab. The official religion and most common religion is Islam. The official and the national language of Libya is Arabic. The Libyan Arabic belongs to the Afroasiatic family of languages. It is divided into two main dialects including the eastern dialect mainly spoken in Bengazhi and Bayda and the western dialect spoken in Tripoli and Misurata. The majority of the population of Libya are Arabic-speakers. That is, about 90% of the population is well conversant with Arabic. The dialing code for the country is 218. Libya is an independent country. It gained independence from United Nations trusteeship in 1951. Its constitution was last ratified in 1977. Following the collapse of Libyan Arab Jamahiriya in 2011, a Government of National Accord was formed under the Libyan Political Agreement. The initiative was UN-led and officially signed in 2015. The UN Security Council Acknowledges the Government of National Accord as the only executive authority in Libya. 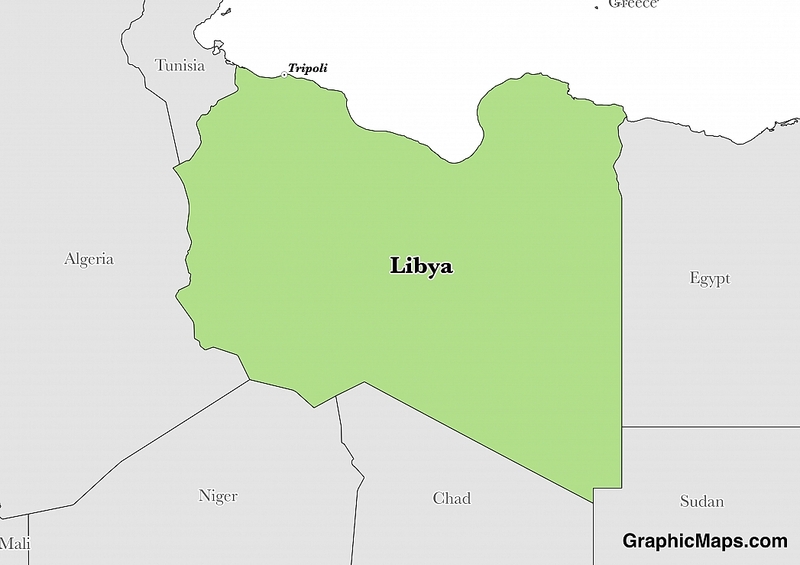 Despite the formation of the GNA, the country remains unstable and divided. Factoring in Purchasing Power Parity, Libya's GDP is $90,890,000,000.00 (USD) with $14,200.00 (USD) per capita. This makes it the 86th largest economy and its citizens the 110th richest in the world. The currency of Libya is the Dinar (LYD). Its major export partners are Italy, Germany, and China. Its main exports are crude oil, refined petroleum products, and natural gas. Its major import partners are China, Italy, and Turkey. Its major imports include machinery, semi-finished goods, food, and transport equipment. 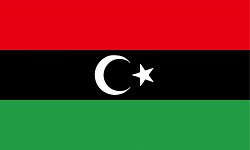 The flag of Libya consists of three horizontal strips of red, black, and green and a crescent and five-star moon at the center of the black strip. The red and green stripes are of equal width while the width of the black stripe equals the width of red and green stripes combined. The flag is in the proportion of 1:2.